was established in 1987, with the initial core of the group formed from an existing church choir. Its founder and artistic director is Galina Koltsova, an Honored Artist of Russia and Academician of the International Academy of Creative Endeavors. In 1992, the Blagovest became a state ensemble under the Committee for Culture of the Moscow Government. The main artistic goal of the ensemble is revival of the Russian church traditions in the sacred music, as well as the discovery of new and forgotten old names of the Russian sacred music composers including the expatriate composers whose heritage is a major contribution to the national musical and spiritual culture. The Blazing Furnace, the first Russian religious mystery of the 16th century based on a Biblical story from The Book of Daniel and arranged by A. Kastalsky according to the Novgorod rite, has been restored and staged by Blagovest in Andronyevsky Monastery in 1992. This rite was served for the last time in the Cathedral of Dormition of the Moscow Kremlin in 1911 (after three hundred years of oblivion) and has not been served ever since.Later, the ensemble accomplished several stagings of The Blazing Furnace. Its theatrical version was performed in the Gogol Drama Theater, and a concert version in the Tchaikovsky Concert Hall and the Rachmaninov Hall of the Moscow Conservatoire. The scope of the ensemble’s artistic activities was further expanded in the third millennium. Its new programs included the rarely performed in Russia pieces by old masters such as G. Palestrina, C. Monteverdi, H. Schutz, D. Bukstehude, A. Skarlatti, A. Vivaldi, L. Cherubini, as well as modern music by L. Bernstein and G. Gershwin, the music for films and musicals by Vangelis, Lloyd Webber, and R. Cocciante, arrangements of spirituals by R. Roger, D. Hermann, R. Show, V. Dyson, L. Gerhard, F. Low, and A. Viskov. The ensemble’s repertoire includes much of the Western European music: J. S. Bach’s «St. Matthew Passion», «Weihnachts Oratorium», Missa h-moll, G. Handel’s «Messiah», the «Stabat Mater» of G. Pergolese and F. Poulenc, and other pieces. The first performances of the Schubert’s Magnificat and Stabat Mater (Latin), and of the works of young Mozart were important events in the cultural life of Moscow. In 1993, the ensemble participated in the staging of the Gluck’s opera-ballet Orpheus and Euridica conducted by S. Sondetskis with stage setting by A. Kozhenkova. The premiere was held at the Hermitage Court Theater in St. Petersburg during the international festival «Diaghilev’s Seasons». The part of Orpheus was performed by countertenor E. Kurmangaliev.The anniversary fifteenth season (2003-2004) was marked by new programs. J. Haydn’s oratorio The Seasons was performed for the first time after a more than 20-years interval at the Great Hall of the Moscow Conservatoire and was directed by the Italian maestro Riccardo Capasso.In the season of 2005-2006, under his direction the W.A. Mozart’s Coronation Mass was performed. The Blagovest Ensemble has taken part in a number of musical festivals in Moscow, Minsk, Kharkov, Smolensk, Kishinev, Tver. It has taken part in the festivals «Transfiguration» in Yaroslavl held in memory of Eugene Kolobov, in the Easter festival «The Spring in Moscow Region – Way to The Temple», in the Moscow philharmonic festivals «Russian Winter», «Talents of Russia», «In Memory of A. Yurlov», «Music in Kremlin», «Golden Autumn in Kremlin», «Spring in Russia», as well as international festivals: in Wroclaw (Poland), «Credo» in Tallinn (Estonia), «Bohemia Jazz» in Moscow. In 1987, the choir performed for the first time the original programs of the First Anthology of Russian Sacred Music created by Galina Koltsova. It was the beginning of the retrospective cycles combining the works of different schools, styles, and periods: the «Moscow Synodal School», the «St. Petersburg School of Three Periods», as well as cycles of sacred music by particular authors such as Vic. Kalinnikov, N. A. Rimsky-Korsakov, A. Nikolsky, P. Chesnokov, A. Chesnokov and others. 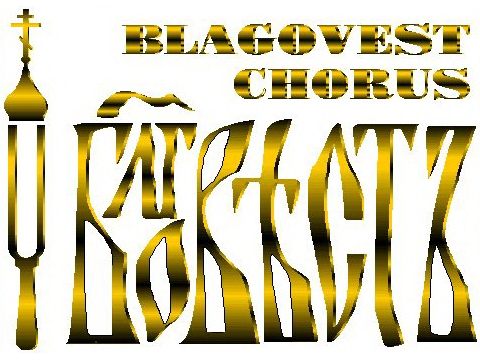 Since 1999, Blagovest addresses the largest compositions for chorus and orchestra. These are the first Russian oratorio Minin and Pozharsky by S. Degtyarev, cantata To Peter the Great’s 200th Anniversary by P.I. Tchaikovsky, cantata John of Damascus by Vas. Kalinnikov, oratorio Christians by A. Viskov. A significant part of the ensemble’s repertoire is taken up by the music of the expatriate Russian composers. The ensemble has accomplished the first performances of the Liturgy, All-Night Vigil, and Russian Requiem by A. Chesnokov, oratorio The Pilgrimage of The Blessed Virgin Among Tormented Sinners (Paris, 1943), Vespers, and Liturgy op. 32 by N. N. Cherepnin, sacred arias, Liturgy op. 13 and 29, Liturgy Domestica, and Missa Oecumenica by A. Grechaninov, and many others pieces. Blagovest has given concerts in Poland, Austria, Germany, Finland, Spain, Greece, South Korea, and the Czech Republic. Being in Austria by the invitation of the Archbishop of Salzburg, the ensemble took part in a festive Mass in the Salzburg Cathedral, performing for the first time the Russian Orthodox music during a Catholic service. In 1997, the Blagovest ensemble took part in the performances of the Imperial Russian Ballet of Gediminas Taranda, given every year in Mikkeli, Finland. The ensemble took part in 14 performances including the Polovetsian Dances from the opera Prince Igor by A. Borodin, the Ball of Maya Plisetskaya with a participation of Maya Plisetskaya, and various folk programs. The ensemble has been in Greece three times. In 1995, it represented Russia at the celebration of the 1900th anniversary of the Revelation of St. John Divine in the island of Patmos. In 1997, Blagovest gave concerts in Salonika, the city chosen for this year by UNESCO as the cultural capital of Europe. The third visit took place in 2003 when the ensemble participated in the cultural program of the 2004 Olympic Games. Li Sun Sin, a new opera by the Russian composer Vladislav Agafonnikov, libretto by Kim Tak Hvan and Bek Ki Hen, was staged at the «Baltic House» theater, St. Petersburg, and later in Seoul, South Korea. Soloists of the Bolshoi Theater and the «New Opera» theater took part in the staging in collaboration with the Korean opera company Seonggok, the Moscow ensemble Blagovest, and the State Hermitage Orchestra directed by S. Sondetskis. The musical director of the staging was Dmitri Volosnikov, stage manager Alexander Feodorov, chief chorus master Galina Koltsova, and the ballet master Che Gong Suk. The opera was the first in history joint project of Russia and South Korea in this genre. In 2004, three performances of it were given in South Korea with a great success. Twice the ensemble received grants of the Soros Institute «Open Society»: for the project Anthology of The Russian Sacred Music and the program Orthodox Moscow to the 850th anniversary of Moscow. As part of the «Open Stage» project of the City Committee for Culture, the Ensemble received grants from the Moscow Government for the staging of two musical theatrical performances. One is The Christmas Holiday, a choral mystery with a puppet show according to the music of A. Viskov. The Moscow Theater of Young Actor headed by Alexander Feodorov took part in the performances. The premieres were held in the Stanislavsky Moscow Drama Theater and the Moscow International House of Music.The other grant was given in 2005 for a new staging of The Blazing Furnace, which was supposed to be a scientific and artistic restoration of this religious performance. The music was composed by A. Viskov. The scenery and costumes were made using the sketches of ancient icons, and materials from the State Historical Museum. The premiere took place in the State Academic Chamber Music Theater of B. Pokrovsky. In the season of 2005-2006, the Blagovest’s program for the first time included the J. S. Bach’s Magnificat. It was performed in the Moscow Roman Catholic Cathedral («Immaculate Conception of The Blessed Virgin Mary»). A series of concerts History of The Russian State in Music was given in the State Historical Museum. In the concert in memory of Georgy Sviridov given at the Great Hall of the Moscow Conservatoire, the ensemble performed for the first time his cantata The Friendly Guest. The season of 2006-2007 saw many new programs. These included the educational cycle Musical Bible which consisted of 6 concerts of sacred music at the Moscow International House of Music. The author of the project and composer was Anton Viskov. The concert cycles at the Great Hall of the Moscow Conservatoire and Tchaikovsky Concert Hall included the Coronation Mass and Requiem by W. A. Mozart, the programs Ave Maria: The Golden Collection and Masterpieces of American Sacred Music, Missa Oecumenica by A. Grechaninov, a suite from the music for the ballet Daphnis and Chloe by M. Ravel, St. Matthew Passion by J.S. Bach conducted by Robert Canetti (Israel), choral scenes from operas by Russian composers, and many other pieces. Galina Koltsova is the founder and artistic director of the Moscow choral ensemble Blagovest, the first Russian professional chorus whose work is completely devoted to the sacred music. Honored Artist of Russia, an Academician of the International Academy of Creative Endeavors, she is one of the most outstanding and prolific modern performers, whose work makes an invaluable contribution to the development of the national musical culture. Galina Koltsova has authored more than 100 original concert programs of Russian and Western European sacred music, which are regularly included in prestigious Russian and international festivals, broadcast on radio and television, and enjoy a deserved recognition by the public and critique. The work of her ensemble restored and further developed the high spiritual traditions of the Moscow synodal school of choral singing. Many masterpieces by classics of the Russian choral music (A. Kastalsky, A. Grechaninov, P. Chesnokov et al.) were given a new life. High importance is placed on the spiritual enlightenment and charity helping to bring about the cultural and ethical recovery of the society, and the establishment of ideals of kindness and mercy. Galina Koltsova created monumental cycles of sacred-music programs, unparalleled in the Russian musical practice, with a lasting and profound impact on the development of the national culture. Galina Koltsova performed successfully as also a symphony conductor. With the State Orchestra of Radio and Television, Moscow Symphony Orchestra, chamber orchestra Musica Viva, chamber orchestra of Kassel (Germany) she conducted such pieces for chorus and orchestra as John of Damascus by Vas. Kalinnikov, Liturgy Domestica by A. Grechaninov, Stabat Mater, Messa G-dur, and Magnificat by F. Schubert, fragments of the Schubert-Denisov opera Lazarus as well as sacred vocal and symphonic cycles by A. Viskov. Close creative contacts connect the Blagovest Ensemble with the composer Anton Viskov. Many pieces of his have been composed for this ensemble. Being thoroughly familiar with the specific character of the ensemble, A. Viskov was able to create and carry out unique musical projects such as the sacred oratorio God, Time Has Come (based on the sketches of I. Stravinsky and M. Mussorgsky for the opera Hovanschina), the oratorio Christians (musical scenes of the ancient Christian services), the Lenten cycle Repentance of My Soul based on the texts of the Dove Book (Russian spiritual folk poetry), choral spiritual concerts, the cycles The Christmas Holiday and Fair Easter, chants for liturgies and all — night vigils, arrangements of pieces of the Russian and Western European classics, arrangements of songs of the peoples of the world, musical and historical restorations and instrumentations (cantata John of Damascus by Vas. Kalinnikov, Russian Requiem by A. Chesnokov, etc.). The ensemble collaborated with outstanding musicians: conductors Vladimir Pon’kin, Sergei Stadler, Alexander Rudin, Saulus Sondetskis, Robert Canetti (Israel), Riccardo Capasso (Italy), Igor Golovchin, and Sergey Skripka, composer Anton Viskov, composer and organist Oleg Yanchenko, great singers Irina Arkhipova, Makvala Kasraschvili, Natalia Erasova, and Dmitri Stepanovich, musicologists Zhanna Dozortseva and Svetlana Vinogradova, famous designer of theatrical costumes and scenery Alla Kozhenkova, and many others. In the season of 2007-2008, the ensemble has celebrated its 20th anniversary. The celebration was supported by the Moscow Committee for Culture. Concerts have been given in all big concert halls of Moscow and included new programs: oratorio Seven Words of The Savior on The Cross by J. Haydn, Requiem by G. Faure, opera Gianni Schicchi by G. Puccini. The Moscow International House of Music presented a new series of concerts by Blagovest: Music of Orthodox Churches of The World. Several new programs of the Russian sacred music have also been performed as well as many other pieces. A new program of Russian sacred music has been presented by the male staff of the ensemble in Karlovy Vary (Czech Republic) where the Blagovest was invited for the celebration of the 110th anniversary of the Sts. Peter and Paul Cathedral. In 2007-2008 and subsequent seasons, the ensemble collaborated with wonderful symphony conductors: Sergey Skripka, Vladimir Pon’kin, Riccardo Capasso (Italy), and Robert Canetti (Israel). The Blagovest Ensemble has recorded several compact disks issued by the companies Multisonic (Czechoslovakia), Vist (Russia/America), Lad (Russia/England), Russian Season (Russia/France), and Daniel C. C. Cho (South Korea). Blagovest took part in the recording of a compact disk for the European Conference on Sacred Music and Christian Culture held in Vatican in May 1993. In 1995, Blagovest recorded with Cantica (Germany) a double compact disk of complete sacred works by N. A. Rimsky-Korsakov, which included 40 pieces. This recording was a world premiere. It ran into several editions and is rated highly.In 2000, Blagovest participated in the recording of the compact disk Russian Sacred Music by Bel Air Music (Monaco). The recording included sacred concerts by D. Bortnyansky, P. Chesnokov, M. Musorgsky, and A. Arkhangelsky. In connection with its 25th anniversary, Blagovest has recorded several CDs with new programs including The Nativity of Jesus and Fair Easter by Anton Viskov, and the golden collection Ave Maria. After 2010 the geography of the ensemble’s concerts extended considerably. It included now towns in the Moscow suburbs such as Zhukovsky, Chernogolovka, Troitsk and important cultural centers of Russia: Tver’, Smolensk, Samara, Tyumen’ and others. New theatrical performances appeared in the ensemble’s repertoire, for example the combined literary and musical compositions based on the N. A. Rimsky-Korsakov’s opera “The Snow Maiden” and the N. V. Gogol’s tale ”The Night Before Christmas”. In 2013 the ensemble took part in the first performance of a new work of the famous Estonian composer A. Uibo “Apocalypse”. Its world’s premiere took place within the precincts of the Roman Catholic Cathedral in Moscow. The permanent cycle of concerts “Musical Bible for Children and Adults” continued in various forms in several halls of the capital: the Chamber Hall of the Moscow International House of Music, the Chamber Hall of the Moscow State Academic Philharmonic Society, and the Concert Hall of Pavel Slobodkin Center. An important artistic undertaking was a lasting series of educational musical concerts devoted to various styles and epochs of the world’s sacred music held in the Rachmaninov Hall of the Moscow State Conservatoire, the former hall of the Synodal school of church singing. The musicians of the Blagovest ensemble prepared special programs of the musical representation of the great Russian poets and writers. Among these, the concerts devoted to N. V. Gogol, A. S. Pushkin, M. I. Tsvetaeva, and poets of the Silver Age deserve to be mentioned specially. In 2014 the Blagovest took part in the Third Volga Festival of Sacred Music in Samara and Togliatti as well as in the festival “Christmas in Siberia” held in the cities of Tyumen’ and Tobol’sk. One of the central recent events in the Blagovest’s creative life was the performance of the V. A. Mozart’s “Requiem” together with the State Symphony Orchestra “New Russia” conducted by Yuri Bashmet. In the season of 2014 – 2015 the ensemble continued its collaboration with the major symphony bodies of the capital. Appreciable landmarks in the creative life of Blagovest were two joint performances with the State Symphony Orchestra “New Russia” conducted by maestro Yuri Bashmet. The “Requiem” of V. A. Mozart and “St. Matthew Passion” of J. S. Bach were performed under the Gothic arches of the Roman Catholic Cathedral. A close creative collaboration established also between the ensemble and the State Brass Orchestra of Russia. This amazing orchestra resembling by its sounding a grandiose organ favoured in the best way a revelation of new artistic colours in such a known piece as the Mozart’s “Requiem” which was performed in the Stt. Peter–and–Paul’s Cathedral in Moscow under the direction of Victor Lutsenko. New editions of the “Requiem” by V. A. Mozart, “Stabat Mater” of F. Poulenc, and “Vesperae Solennes de Confessore” of V. A. Mozart for piano and organ accomplished by the composer Anton Viskov became an interesting version of performance of the known pieces of sacred music. In May of 2015 the ensemble took part in the Moscow International Easter Festival under the direction of maestro V. A. Gergiev. Performed were a J. S. Bach’s cantata, selected fragments from the G. F. Handel’s “Messiah”, and the program “Ave Maria: The Golden Collection”. Three concerts from the cycle “Russian and West-European Choral Miniature” were given with a great success and invariable interest of the audience in the Rachmaninov Hall of the Moscow State Conservatoire. The selected masterpieces of the world’s sacred music were performed in these concerts with a remarkable skill and subtle understanding of the composer’s style. Two cycles of concerts were given in the Chamber Hall of the Moscow State Academic Philharmonic Society: “Musical Bible for Children and Adults” devoted to great Christian Holydays, and “A. S. Pushkin’s Fairy Tales” which contained the musical representation of such works of the great Russian poet as “The Tale of The Dead Princess and The Seven Knights”, ”The Tale of The Fisherman and The Fish”, and “The Tale of The Priest and His Workman Balda” (in Zhukovsky’s version). In the season of 2015 – 2016 the ancient Gothic vault of the Moscow Roman Catholic Cathedral heard the monumental cantata “Stabat Mater” of F. Poulenc and “Vesperae Solennes de Confessore” of V. A. Mozart as performed by the Blagovest ensemble. A great success was the jubilee concert of Anton Viskov given in the Chamber Hall of the Moscow International House of Music. It included the best works created by the composer in collaboration with the Blagovest ensemble. The 30th, anniversary season of the ensemble was marked by a lot of the touring activity. An important event was a performance in the ancient center of Western Russia, the resembling an open-air museum town Staraya Russa at the celebration of the miraculous Staraya-Russa icon of the Mother of God. There were also a performance at the Tikhon Khrennikov Festival in Lipetsk, a concert in the homeland of Sergey Esenin – the town Ryazan’, and a charity concert in the Russian Cultural Center of the city Astana in the framework of the state-to-state program “Days of Moscow in Kazakhstan”. The ensemble has visited many towns of the Moscow region, conducted the traditional memorial service and concert in memory of Marina Tsvetaeva, and participated in the grand musical stage project of the Moscow Government dedicated to the 100th anniversary of the October Revolution. Blagovest took part in the jubilee performance of the composer and conductor Anatoly Poletaev, became a winner of the award of the Moscow social club “Theatregoer”, and presented a number of new programs in such halls of the capital as the Rachmaninov Hall of the Moscow Conservatoire, the Concert Hall of the Central House of Artist, the Concert Hall “Teatralnaya Khoromina V Kolomenskom”, the Great Hall of the Journalists’ Union, the Concert Hall in Prechistenka. Several new young soloists, graduates of the Moscow musical colleges have recently joined the ensemble and proved themselves as gifted musicians ready to broaden their artistic horizons. A series of radio broadcasts and TV series about the Blagovest Ensemble have been prepared at the channels “Culture”, “Spas-TV”, “Radio Vera”, “Radio « Moscow Speaking»”. There appeared also various internet publications. The effective work of the new management team ensures reaching new horizons in the creative activity of the ensemble.